Visiting Washington, DC this Summer? Visit a Peace Monument! Now that the official start of the summer of 2014 has begun, Washington, DC will be a destination for many. Because museums and monuments are easily accessible (and free, such as the Smithsonian), it is an ideal summer vacation stop, especially for families. Young people in particular benefit from a vacation that is fun, as well as educational (of course, education is fun!). The Peace Monument on the right, the Capitol on the left. The clouds of war above. Generally, when one thinks of visiting the Nation’s Capital viewing iconic sites such as the Lincoln Memorial, Jefferson Memorial, Washington Monument, and the Capitol, come to mind. However, many of our memorials and monuments tend to focus on our country’s sacrifices in war, and not so much our efforts at peace. Of course, one can argue that war memorials such as the Vietnam Memorial and WWII Memorial are also anti-war monuments: that is, they raise the often questionable sacrifices that have have been made in the pursuit of war. However, there are distinctive peace themed monuments and memorials in Washington, DC that can be viewed publicly. Visiting these sites provide an opportunity to have thoughtful discussions (particularly with youth) on the justification and consequences of armed conflict. They also recognize the sacrifices that individuals have made in settling differences through negotiation, diplomacy, and nonviolence. These are also important values that we need to emphasis as a nation. In Washington, there is a range of memorials and monuments that emphasis peace, sometimes created after war, other times as an alternative to avoid war. A valuable resource is the work of Edward W. (Ted) Lollis, a retired U.S. Foreign Service Officer. He maintains an on-line database of “Peace Monuments Around the World. ” He has also published a book, Monumental Beauty: Peace Monuments and Museums Around World, which is a great resource for not only locating, but also understanding peace sites globally. For Washington, DC, Lollis has developed a guide that can be accessed online and used as part of a walking tour. 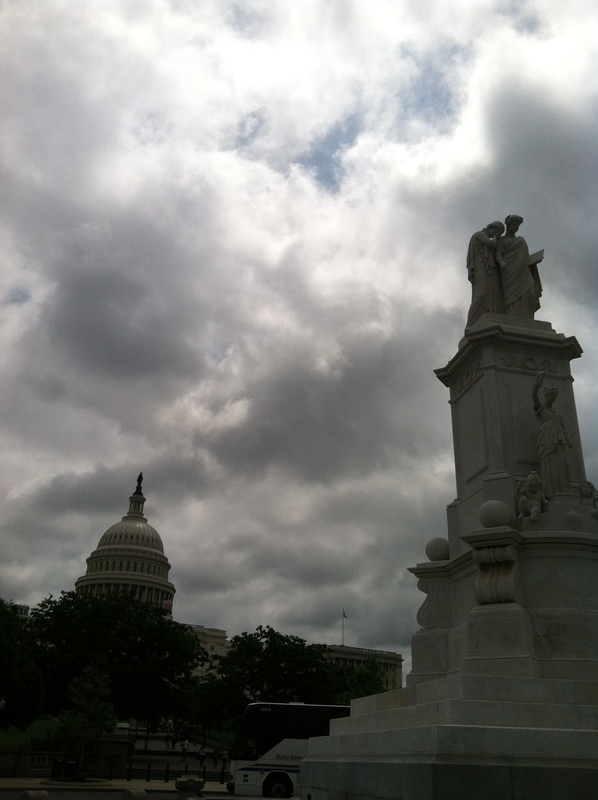 Over the summer, I plan on periodically posting on specific DC based sites that I visit. 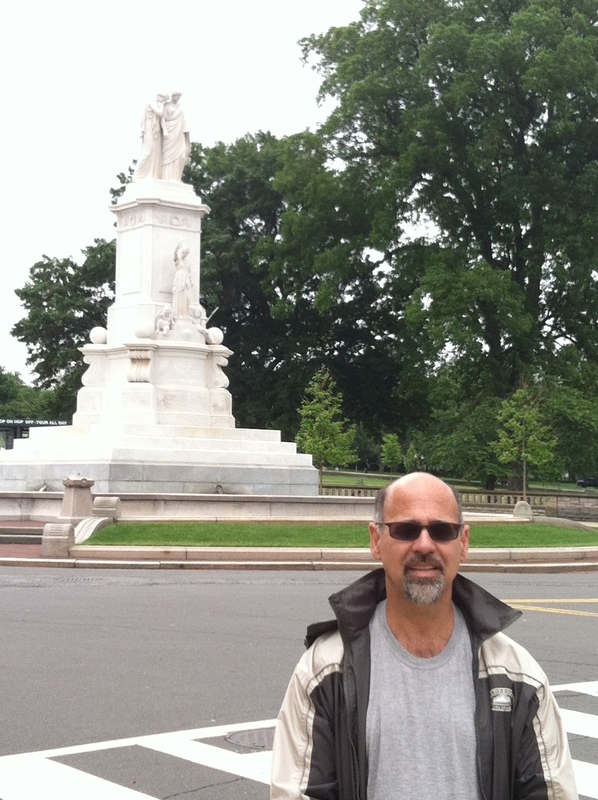 I want to start with the Peace Monument which is located in front the west side of the U.S. Capitol. Completed in 1878 and sometimes called the Naval Monument, it honors the “officers, seamen and marines of the United States Navy who fell in defense of the Union and liberty of their country, 1861-1865.” It was sculpted by Franklin Simmons of Maine, who is responsible for the statue of Roger Williams located in Statuary Hall. As part of the memorial is the goddess “Peace” holding an olive sprig. At one time there was a dove that sat on a sheaf of wheat, but it has long been missing. More information about the Peace Monument and other DC monuments can be found at DC Memorials.com. There is also a detailed Wikipedia entry that can be accessed. If you visit some interesting DC area peace sites this summer, send me a comment on your impressions. The Lincoln Memorial has been the site of many a large peaceful rally. Martin Luther King gave his “I have a dream” speech from the steps of the Lincoln Memorial. Several large anti-Vietnam War rallies were held there. The Vietnam War Memorial is very much dedicated to opposing the horrors of war rather than glorifying them. It is a simple list of all the names of fallen American servicemen in the Vietnam War engraved into a granite wall. The sheer number of names is overwhelming.